Hi Ronan, I hope you find the new custom plan section of the site useful. OK I think I have a suitable design for your project, by the way thanks for all the information it helps me a lot. 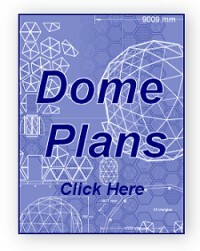 Take a look at this link: Solaris dome This design can be packed flat, has very few different parts and will bolt together easily. The main benefits are: 1. You can cover this design with canvas without using sealants and it will be totally waterproof. 2. No problem to put windows anywhere on the sides, they won't leak and you have complete freedoms with the shape. 3. As a bonus you can join two or more together of you need more space or just for fun. What I'll do next is upload some detail of why it is easy to waterproof and a sketch of a 4.5m version. I've done a quick sketch of the covering method with this type of dome. The top panels have the overlap at the bottom of the diamond and the bottom panels have it at the sides.I would recomend covering the frames with thin plywood first then glueing the canvas on top, you may need to put a hem on the overlap to stop the canvas fraying. just some of my design sketches. very rough but might clarify my ideas a little. Your drawings all look fine, the only one I have reservations about is the alternative fixing method, I think it may be difficult to pull the frames together with a bracket. I would go with the bolt holes in the frame. thanks paul. ill take that into consideration. i would prefer to use boltholes. i may need to use a slightly thicker timber to allow for the bolts, this is my concern.i think the right size would be the 19ft 6in design based on the gd27 because it seems to have a lower profile that the 4.5 meter counterpart.is this correct? i am asking about this as i dont want it to be too high for the assembly process. what would be the maximum thickness that could be used for this design?